KODAK has been the creator of the format 110. In 1963, Kodak had created the square format 126 square, using a 135 film in a special cartridge. This cartridge forbade all incorrect manipulation, for example doubles exposure. This world success follow by the greatest companies pushes KODAK in 1972 to do evolve this concept by creating a smaller cartridge, silver films having made huge progress in 10 years, and by manufacturing smaller cameras. 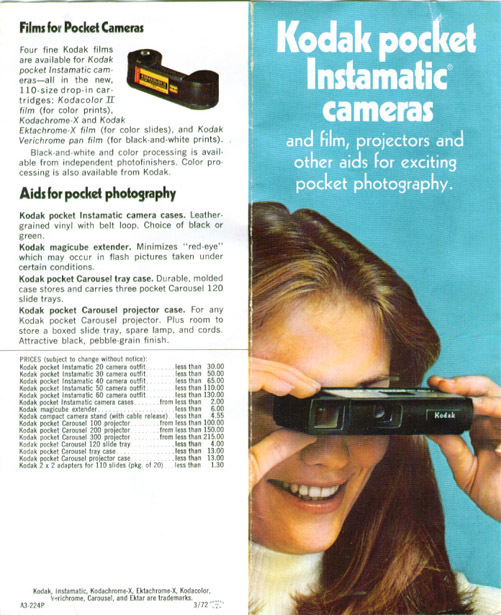 Cameras that every one may put in his pocket : the INSTAMATIC POCKETS. 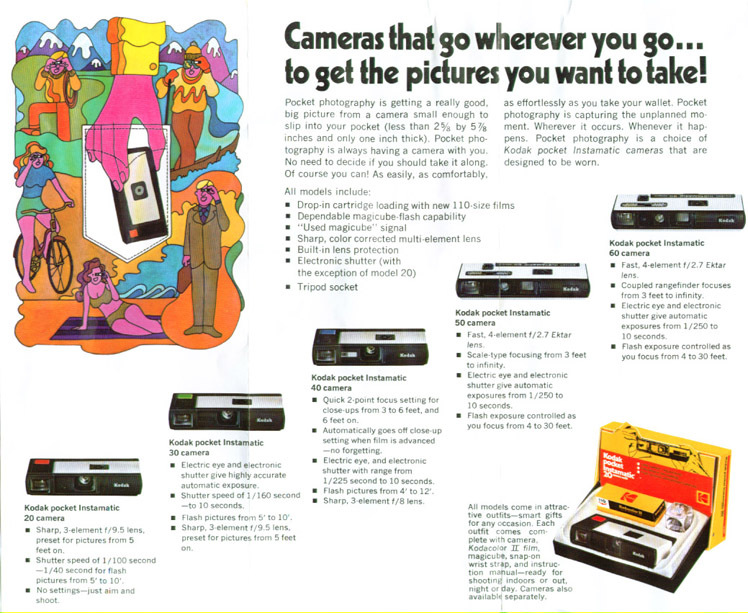 In 1972, Kodak launches five cameras on the American market, the Kodak Pockets 20, 30 40, 50 and 60 that will be soon followed by the Kodak Pocket 10. All models use the same film loading system with the sliding door that will be kept by Agfa., Magicubes with a signal of utilization in the view finder. Electronic exposure (except for models 10 and 20), fix-focus except for models 40, 50 and 60. (1972) Simplified market entry camera. It is appeared on the market after the five other American models and has completed the range by the low. In 1972, this camera was sold less than 20 $. Mechanical shutter with an unique speed. Fix diaphragm (probably 9,5), any lens protection. Kodak Logo on the frontal panel and identifier "Kodak pocket INSTAMATIC 10" engraved in white on the top panel. 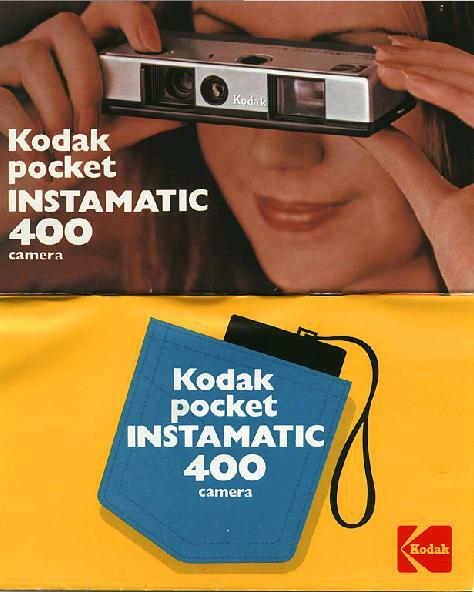 (1972) This camera as 30 and 40 belongs the average range of Kodak pocket Instamatic. The most visible difference between the three models resides in the color of the release button. They possess all a sliding cap protecting the lens and blocking the shutter. In 1972, this camera was sold less than 30 $. Mechanical shutter with an unique speed in 1/100 sec., commutes automatically to 1/40 sec. when using a Magicube. Identifying: "Kodak" on the frontal panel and identifying "pocket NSTAMATIC 20 camera" engraved on the top panel. shutter release button in red plastic. (1972) Evolved version of the pocket 20, it has an electronic shutter. As next models, it uses a particular battery "K serie" that is placed inside the machine near the film. In 1972, this camera was sold less than 50 $. Electronic shutter from 1/160 sec. to 10 sec. Identifying: "Kodak" on the frontal panel and identifying "pocket NSTAMATIC 30 camera" engraved on the top panel. shutter release button in green plastic. (1972) Evolved version of the pocket 30, it has in addition to a macro focus system activating by cursor. In 1972, this camera was sold less than 65 $. Identifying: "Kodak" on the frontal panel and identifying "pocket NSTAMATIC 40 camera" engraved on the top panel. shutter release button in blue plastic. (1972) This model belongs the two high range cameras and possesses a presentation in metal , more long than preceding models. it has an automatic exposure system and a focus by cursor with a scale of distance in feet (white ) and in meters (yellow). The lens has coated lentils and is more luminous. It uses the particular battery "K serie" that is placed inside the machine near the film. In 1972, this camera was sold less than 110 $. Electronic shutter from 1/250 sec. to 10 sec. Identifying: "Kodak" on the frontal panel and identifying "pocket INSTAMATIC 50 camera" engraved in metal on the top panel. (1972) This model is the flagship of the Kodak models. It has had no equivalent in other marks. Added to characteristics of 50, it possesses a power development by coupled telemeter. This particularity is unique in the universe of format 110 and indicates ambitions of Kodak on this new (tin 1972) format. In 1972, this camera was sold less than 130 $. Focus from 1 meter to infinity by cursor with coupled telemeter in the viewfinder. Identifying: "Kodak" on the frontal panel and identifying "pocket INSTAMATIC 60 camera" engraved in metal on the top panel. At the same time that the American model were launched, Kodak proposes for the European market five cameras manufactured in Germany then in England : Kodak Pockets 100, 200, 300, 400 and 500. All models use the same system of loading defers with the door pivoting sideways more practical than American models, a Magicube with signal of utilization in the viewfinder . They have all a shutter cap protecting the lenses and blocking the release shutter. Contrarily to the models US, Cameras 300 and 500 have a scale of distances but without focus assistance and only 500 possesses an electronic shutter. While American models privilege the facility of utilization, "push and we will do the rest", this concept seems too simple for European consumers, more a camera is evolved, more it needs choice and offers many possibilities to the user. 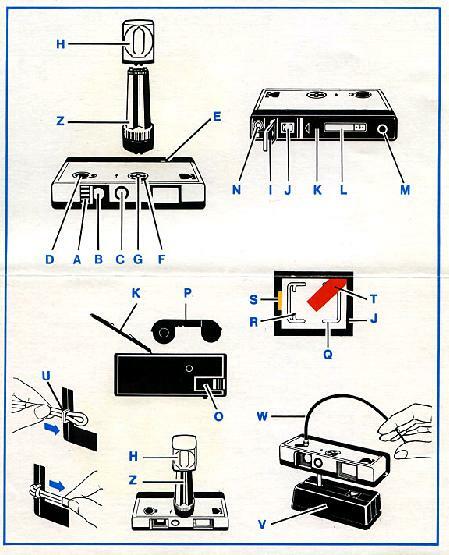 (1972) Simplified market entry camera. As the other European cameras, it has a lens cap which protects the frontal lens and a wrist-chain in cloth. No adjustment. Black Kodak sign on the frontal panel and identifying "Kodak pocket INSTAMATIC 100" engraved in gray on the over. Round release button in black plastic matter. Mechanical shutter with two speeds. Metallic plastic Kodak sign on the frontal panel and identifying "Kodak pocket INSTAMATIC 200" engraved in gray on the over. (1972) Camera of middle range. As the preceding model but in plastic bi-tons black and metal. It possesses also a diaphragm adjustable by cursor with scale distances in blue for flash utilization and with five weather report symbols : veiled cloud, cloud, veiled sun, sun and mountain for daylight utilization. It has a lens cap that protects the frontal lentil. Metallic plastic Kodak sign on the frontal panel and identifying "Kodak pocket INSTAMATIC 300" engraved in gray on the over. (1972) Camera with exposure by electronic shutter. It possesses a plug for release and a lens cap that protects the frontal lentil. Electronic shutter which change the speed. Metallic Kodak sign on the frontal panel and identifying "Kodak pocket INSTAMATIC 400" engraved in gray on the over. (1972) Camera of range high . More long than preceding models but with a body in metal and an exposure by electronic shutter. It possesses it also an adjustment of diaphragms by cursor with scale distances in blue for flash utilization and two weather report symbols : cloud and sun for utilization of day. It has a lens cap that protects the frontal lentil. It adds in more an adjustment of distances by cursor : scale in meters and symbols. It possesses a plug for release. It has a lens cap that protects the frontal lentil. Metallic Kodak sign on the frontal panel and identifying "Kodak pocket INSTAMATIC 500" engraved in gray on the over. Personal collection © photos Pierre J.